Never thought that I’ll write something on FDM (I consider myself as a beginner on FDM and still need to learn a lot). However here I’m writing about customizing FDM load script. After lot of struggle with the tool (I’m getting old, it not easy learning from here on) I was able to get the data load automated. I started the load and it was running forever!!!!!! 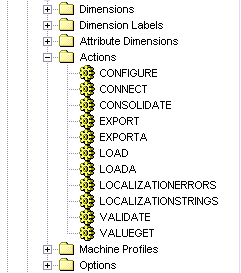 I was first blaming my lack of FDM knowledge, so decided to look at Essbase log and check what is happening. I saw that each clear (fired by FDM) was taking 4.25 secs. Now you’ll think why is he bothered about 4.25 secs. The issue was with how the Calc script is generated by FDM. strClear = strClear & "EndFix"
It says @Idescendants (strEntity), which is a level 0 entity and the statement is generating an empty memberset and the script runs for the entire Entity dimension. Read about the issue with EMPTYMEMBERSET here. I kept wondering why this is not there in the default script. Thrilled by my discovery I started loading data again. The changes did reduce the time. It is now taking 0.016 secs, which is good. But is it? Math shows that 0.015*123238=1971.808 secs, 33 mins (at-least it is not hours). Can we reduce it further? I created a dictionary to read each entity from the FDM generated data file. The good thing about dictionary is I can check whether the entity is present in it, if not present add it to the dictionary, else proceed with next entity. This way I can get the unique member list (Entity) and run the script only for those members. Here is the updated script. strFileWrite = CStr(Left(strFile,Len(strFile)-4)) &"_entity" & ".txt"